Holds up to 4.5 litres of liquid. In line sockets for 'paint cup', 'tool lasso' or 'utility hook. Making working at height easier will benefit all parties, enabling work to be carried out safely and efficiently. Our utility buckets are a great help when working at height providing an easy way to keep liquids with you while working at height. They hold up to 4.5 litres of liquid, which will greatly benefit someone working in industries such as painting and decorating. 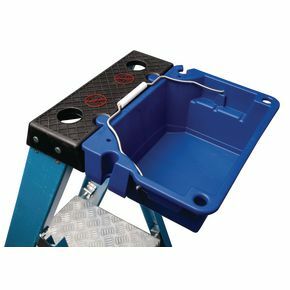 In line sockets are there to allow you to also have a 'paint cup', 'tool lasso' or 'utility hook' (all also available to purchase on the Slingsby website) with you while working at the top of a ladder. The buckets have an 11kg load capacity and suit both the industrial and trade glass fibre steps. Please note this product is an accessory and cannot be purchased separately. To view the parent product please enter the product code '385438' into the search bar at the top of the page or click the link on the right hand side. Our utility buckets will help a user working at height to be safer and work more efficiently and they come with a 12 month guarantee.